Rural Broadband Solutions - Unlimited Data and Decent Download Speed? Forums › New Zealand Broadband › Rural Broadband Solutions - Unlimited Data and Decent Download Speed? We are looking at purchasing a lifestyle property about 15km inland from Timaru. Currently has ADSL delivering about 2mbps down (VDSL and fibre not available). I need decent download and upload speeds for work (currently 40 down and 10 up) and move a decent amount of data (monthly use over the last year was 540GB low and 960GB high. RBI is available, but the plans I can see with decent download speeds have restrictive data caps, and the few I can find with unlimited data have capped download speeds (10 or 5). There are a couple of providers with their own antennas but their plans are similarly restrictive. There is line of sight from the roof of the property to Timaru CBD. Is there a precedent for a point to point connection from the roof of a business in town who's willing to co-operate, or another solution I'm not aware of? I'd be happy to invest a few $000 as a one off to set up a solution, but don't really want very high on-going monthly bills for usage. Appreciate it might not be possible - or not possible within my budget. If so we'll just have to pass on the property. Thanks in advance for all the words of wisdom I know will be forthcoming! add an extra zero or two to your number and a NGA on application may be a good option? For your requirements, a RBI product is not suited. Potentially a local Wireless provider - but even then might not be too pleased with your load requirements. Offering True unlimited over a cellular service simply isn't feasible. takes a couple of users to blow all the bandwidth. I do really appreciate your approach though, check connectivity options before signing not after when your stuck with it! Another option may be finding someone line of sight who can get UFB or better VDSL and do a point to point wireless setup. There is a good thread on here about someones Ubiquiti setup a few years ago if you search for it. WISP or DIY would be the two options I think you have. Or start at 20k+ for NGA UFB if you're lucky. Do you really need to transfer all that traffic in and out of the woops, can you not have some hosted servers and desktops and remotely drive them on a RBI wireless solution to cut the RBI traffic flows and leave them back at some city based data center. In reality it surely does not have to all be at your feet. This should be eminently do-able with a PTP link, if you have line of sight to someone who can receive good VDSL or UFB. I have a pair of Ubiquity Powerbridge M5's sitting around and if I plug those details into airlink.ubiquity.com, could get a 100Mbps link without issue. I have no idea where you are looking at, but I took for example the corner of Taiko Rd and Cliffs Rd. If you or anyone else is interested, it would be nice to see my pair of Powerbridges go to a good home. I have a pair of Ubiquity AirFibre Gigabit radios for sale (in the Offers and Wanted forum).. Get Fibre installed remotely and get Fibre speeds to your home..
cyril7: Do you really need to transfer all that traffic in and out of the woops, can you not have some hosted servers and desktops and remotely drive them on a RBI wireless solution to cut the RBI traffic flows and leave them back at some city based data center. In reality it surely does not have to all be at your feet. Worth checking to see if rural fiber is available. Expect a $6000+ of install cost if it is. the answer to your original question is no, you are likely going to have to change your habits. Scott3: Worth checking to see if rural fiber is available. Expect a $6000+ of install cost if it is. Wouldn’t be surprised if it’s above $150k, to have a rural ufb connection installed. This could be an option, message me your address and I'll spend 5 minutes checking some options for you. I’ve just moved my IT business from Whangarei to inland Oamaru. 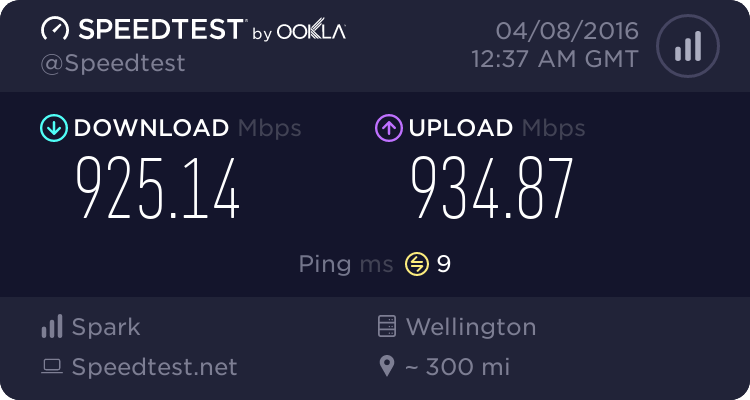 We had gigabit fibre with unlimited data in Whangarei and had everything in house on our own servers. Done here there’s no dsl at all or fibre. RBI coverage isn’t great either so went with a local WISP, Ezykonect, and have a 12 down 1 up link with 360gb of data a month. I’ve moved all our required servers into the cloud, on Azure, and everything is working great. Almost used the full 360gb last month and that’s with two kids and wife doing a lot of online streaming.